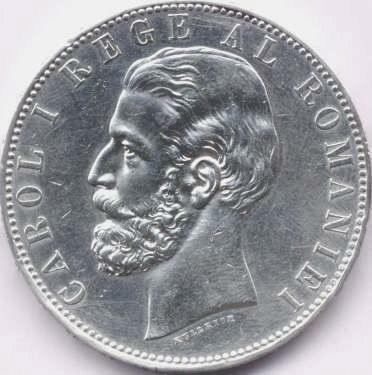 denomination "5 L", year 1883, Romanian coat of arms, letter B and wheat ear, the signs of Romanian mint, outer pearl circle inscription "CAROL I REGE AL ROMANIEI" meaning "KING OF ROMANIA" and CAROL I head facing left, outer pearl circle. Under the neck lies KULLRICH, the engraver's name. 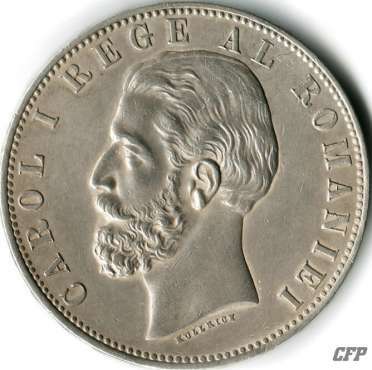 The silver coin pictures above are present on Romanian coins through the kind permission of Mr. Radu Lissner, as well as the images of the three 5 lei pieces (1881, 1882 and 1885) below. The 5 lei coin was struck in 1883 with several dies resulting in several variants of the coin. The vertical axis of the shield is straight. The vertical axis of the shield has a slight inclination from upper right to lower left. More visible, the upper crown is bigger and has other ornamentation. The series of 5 lei coins of 1881-1885 has several different markings on the edge. As seen on the images below, there are four variants with five or six stars having five rays each and one featuring six ray stars only. Two of the five ray variants were obtained by rotating one star by 180 degrees (variants known under the denomination "a star sits on a ray"). In the image below can be seen the group of five stars on an 1882 coin. Below are presented the images of a complete inscription, taken from the edge of an 1883 coin. 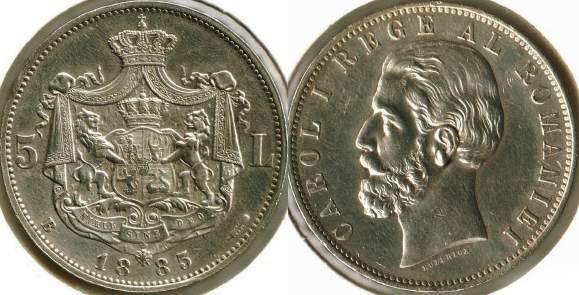 Struck in 2.300.000 pieces, year 1883 is the most common of the series. Year 1885 is the rarest - only 40.000 pieces. 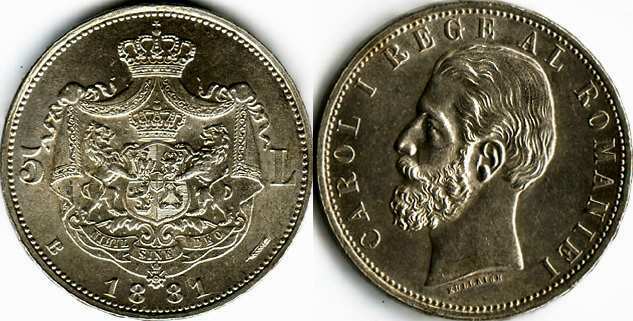 Having a diameter of 36.5 millimeters, the 1885 5 lei is also the smallest 5 lei struck under Carol I. The second in rarity is the 1884 piece (300.000) and third the 1882 (1.100.000). In 1881 1.230.000 were struck, frankly saying, this later reminded mintage comprising all five variants of edge engraving. Below there are three superb pieces of 1881, 1882 and 1885. It is easy to notice the different pattern of the crowns atop the tent. 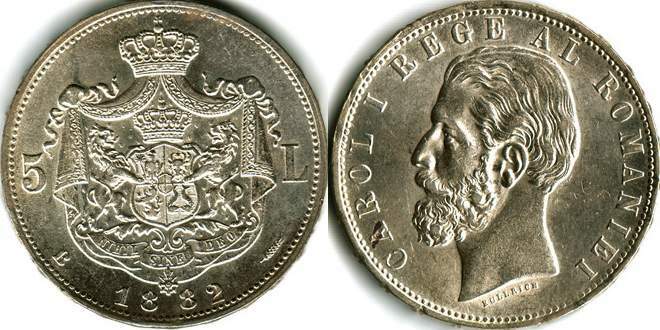 The 1881 coin is the variant 69e from MBR, with six stars, the fifth star sitting on a ray. Thanks again to Mr. Radu Lissner! The issue of establishing the boundary between variants and striking errors. A mintage is composed of several batches struck over the length of a year accordingly to the needs of the market seen by the National Bank. For each batch new dies not identical to the preceeding ones were used, with or without the intention of the engraver. 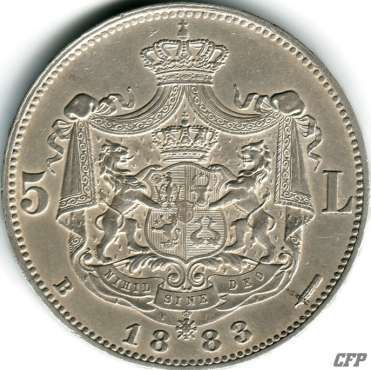 The images of the 5 lei coin minted in 1884 (below) are present on the site through the kind permission of Mr Florin Andrei Lungu. 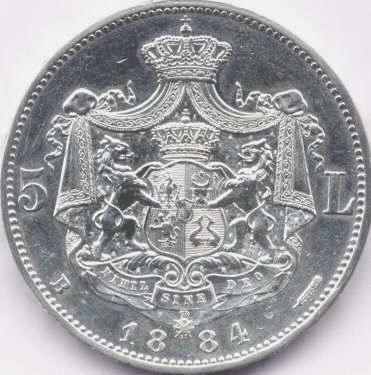 [...] a variant of 5 lei 1882 coin. It is about a coin that, in the year emplacement, features digits 8 and 2 slightly farther apart than the normal type coin. The outer pearl circle can serve as orientation marks that can decide the length between the two digits (three or two pearls). Whether or not several die sets for year 1882 can be taken into account it is plain to understand by checking the inclination of the vertical shield axis - the variant with 8 and 2 farther apart features the axis pitched (from upper right lower left), similarly to the situation of the 1883 piece of 5 lei (already on the site). Unlike the 5 lei 1883, there are no differences in the design of the crown atop the coat of arms. No dissimilarity was noted on the reverse either. The variant is slightly rarer (the year itself 1882 is rarer, being difficult to find a 1882 piece in good condition); for clarifying I sought on the web (ebay, okazii, etc. ), I think I found one more besides mine comparing to five or six regular pieces. I deem that 5 lei 1884 or 1885 can also feature variants, except for, due to their rarity, it is difficult to have two such different pieces one next to the another in order to have them compared and eventually identified as such. Due to the small mintage it is also possible that such variants did not exist at all. I send in attachement, for comparison, the pictures of the two coins. The images above are present on Romanian coins through the kind permission of Mr. Cătălin Gavrilă.